The week-end preceding Christmas was quite lively at the Berkeley Saturday Farmer's market, with favorite farmers and vendors bringing great produce and a sweet Holiday spirit to close 2013. Jujube dates, sunflower sprouts, blue oyster mushrooms and mango-size persimmons caught my attention. I had never used jujubes before so I picked a few to experiment with. The persimmons looked incredibly ripe and tasty and immediately evoked dessert (never mind the FODMAPS!). On the way I also picked a few squashes (more for another post), a Meyer lemon, sorrel, which I like to buy for soups in the winter, red kale, market fresh shrimps and an incredible pasture raised poulet rouge. I decided to use all of (and as much as possible, only) these produce for Christmas eve and Christmas day dinners. I started with a batch of gluten-free lemon madeleines. This was a first trial at making them, and I was surprised by how the 1 lemon I had used (the non-GF recipe I was adapting would have called for 2) could be so fragrant in the madeleines! 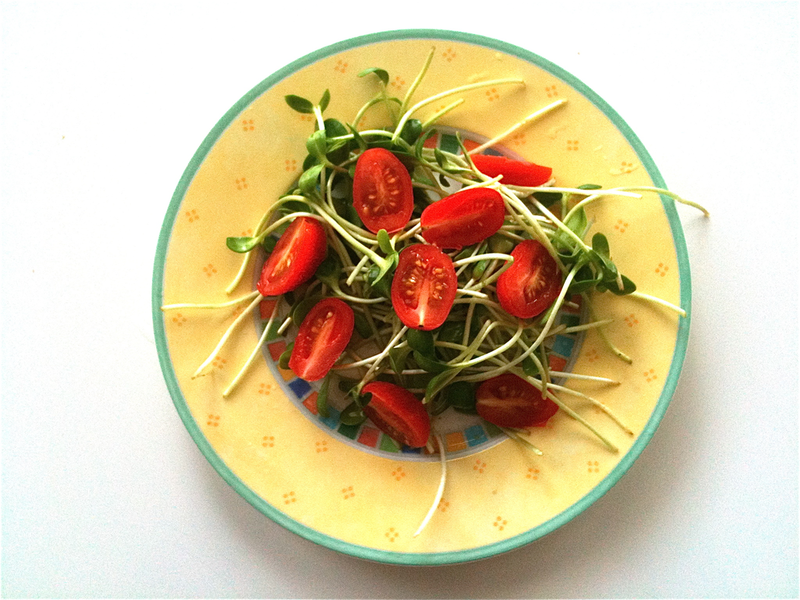 The sprouts were crunchy, tasty, and great in a simple salad with a light dressing (soy sauce, rice vinegar, maple syrup, a dash of sesame oil and pepper). Here candle-lit picture for the occasion. 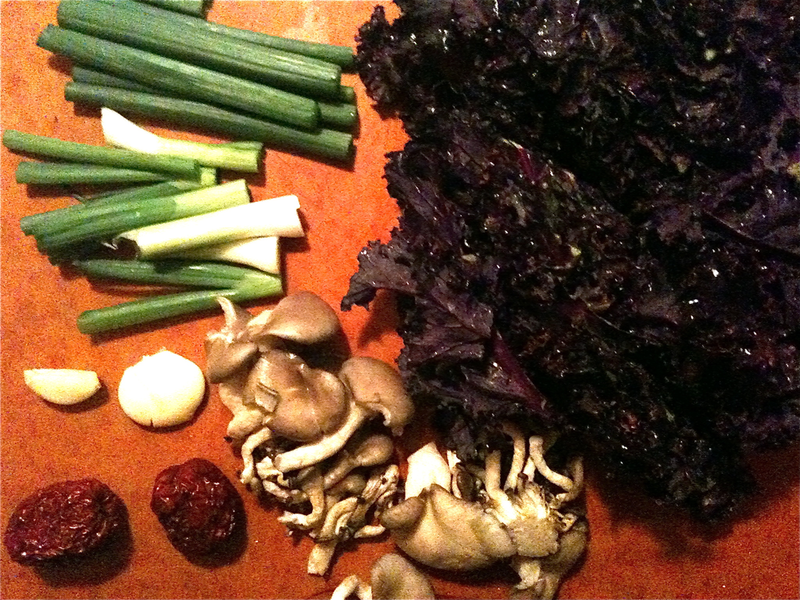 For Christmas Day, I wanted to make something substantial, and experimented with an interesting combination of the red kale, a few jujube, the mushrooms, some green onions I had and the chicken. I was rather curious as to how the flavors would work together. and the vegetable and poultry were left to stew on simmer, covered with water and seasoning, until the chicken was cooked. I used the remainder of the mushrooms in a risotto, cooked with a dash of white wine and the stock from the veggie and chicken pot. This ended up being another comforting and satisfying wintery dish, with the stock providing a rich flavor to the risotto. Here I have to give ode to the pasture raised chicken, which is quite different from its supermarket bought counterpart. And to finish, a persimmon sorbet which required barely any work, and no time to eat either! Jujube have a number of medicinal use, for example in improving liver health. It is always enchanting to witness the transition of produce as Summer cedes place to Fall. One savors the last sweet cherry tomatoes, flavorful squashes and other Summer produce... And then the first pumpkin arrives, bringing visions of velvety soups, risottos and of course muffins, pies and other Fall traditions..
...rallying along with it, root vegetables and squashes of all shapes, colors (all in in line with the fall) and names..
All these can be made gluten-free and dairy free as needed/desired.